Just wanted to write a note about the gig in Macroom on Saturday night in Cork. We arrived down with a mini troop for the event some Luka 'Virgins' others big fan's. I was so excited beforehand waiting in anticipation for Luka to come out. I really enjoyed the fella and girl who supported Luka. She had an amazing power in her voice and a beautiful sweetness too. The songs told stories of love, heartache and empowerment. Well done I say. Then Luka came out and started off the evening in the theme of spring. It was lovely hearing him and the Spanish guitar again, it was like coming home. The audience were starting to get warmed up and eagerly joined in on "I am not at war with anyone". A fine bit of singing was heard by all. Luka kindly sang a new song that he had been learning, "Blackwater Side". He told us that years ago in the 'Moore' house Anne, his sister would sing this song. Thanks for that Luka. As the gig progressed the audience were flying along singing to any song they could and we did a lovely version of "Sunny Sailor Boy". The encore brought a lovely surprise of Luka singing "I need love". Wow, it was such a sensual rendition of the song, it was amazing! Then he followed it by "Black is the Colour". What a fantastic first gig of the year and may the year only get better. At the Dranouter Festival, I'm always a bit hungry. Hungry for music. Eager to discover bands that have never performed in Belgium before, or bands that are so unknown to me that I wouldn't pay an expensive ticket to see a dedicated concert. On a festival, the situation is completely different. You pay for the entire festival, and in order to get maximum value for money, I start getting hungry-for-more-music on the very moment the festival opens. We were actually running from one tent to the other. First we enjoyed David Munnely band & some guests. We hurried to the main stage to witness an excellent replacement-performance of Novastar-genius Joost Zwegers. The last notes still echoing across the festival area, we took a little sprint to catch as much as possible from Call of the Mountain. A very nice Folk and world music mix, which almost made us forget that we had to leave the performance to be in time for Luka Bloom. So we took our festival bag, stumbled across what seemed like a million feet in the Clubstage tent and ran back to the Kayam main stage. Just in time to find a still acceptable location in the audience. This may come as a shock to you, but I hardly knew Luka Bloom. His name sounded quite familiar, but I couldn't remember a single title of his tracks, and I didn't know that he actually is Christy Moore's brother. (By the way: note for the Dranouter guys: I missed Christy Moore last year. Eh... we want Moore... come-on... there's always place for one Moore... Maybe even for more Moore's :-)). 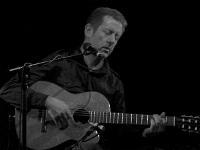 The audience was enjoying Luka Bloom in a major way. Silent and respectful when they had to listen; applauding enthusiastically and singing along whenever needed. 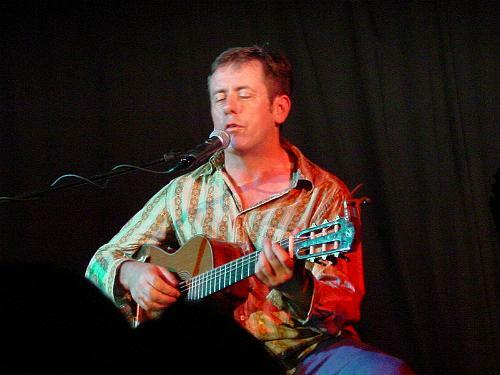 The very sober performance with only his voice, a guitar, and for some tracks a clarinet/saxophone caused goose bumps on several occasions, and I discovered that Luka Bloom is Big when it comes to writing. He has some wonderful deep texts, and his music is at least as good. During the concert, I even discovered some tracks that I actually knew (but of course did not associate with his name). Most of the songs where completely new to me (shame on me - blush). Some tracks I remember though: "City of Chicago", "Gypsy Music", "Exploring The Blue", "No Matter Where You Go, There You Are" about his friend Mohamed; "Monsoon", which turned me from 'just a listener' into a brand new Luka Bloom fan. He went on telling that in the late eighties, early nineties, he had his six minutes of fame with a song... And he became so tired of it, that he didn't play it for almost 5 years. Then he started "I need love", which most people probably will remember in the original LL Cool J.-version (which was actually considered as the first pop-rap crossover track). Oh... and I really should not forget to mention the magnificent "Rainbow Day" and "I'm a Bogman". The talented singer/songwriter tried to explain what a bogman actually is. In Dutch it sounds like "Ik ben een turfsteker", and he even succeeded to translate that in German and Finnish as well, though I have to say... I couldn't verify the Finnish... (though I'm willing to give him the benefit of the doubt - oh... and couldn't care less if it was pronounced incorrectly). Sunny Sailor Boy was one of the goose bump moments that made me shiver from the bottom of my back to the center of my brain. He learned us how to sing ooo-wa-oo-naah in some variations, that fitted surprisingly well into the track. Even when I tried to sing along, the fans (the entire audience must have been transformed into fans by that moment) kept on going as if I wasn't THAT bad... very sweet. Thanks! Anyway, Luka (Since I'm a fan now, I can say Luka, can't I?) already mentioned that it had been a long time since he said to an audience that they "were the best singers he ever played for", and the audience prooved him damn right by ooo-wa-oo-naah-ing Sunny Sailor Boy to a higher level. Mr Bloom received a nice bucket of flowers (read 'Bouquet' to keep up appearances) to indicate that the official gig-time was over. Off the stage he went... while the audience-choir still tried to fill the enormous concert tent with a sober, yet intense ooo-wa-oo-naah, repeating the only line of text the master had teached them. 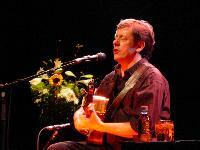 Some people started applauding, some others started singing louder, and at last, Luka Bloom entered the stage again, making the crowd go nuts of joy. When he reached for the microphone, the cheering ssshussst a bit and the talented performer said "Thank you... I just went of the stage to better hear you singing." PS: One more thing. It does not happen very often that I have two similar experiences of this magnitude at one festival, but less that 48 hours later, Seth Lakeman also impressed me in a major way. 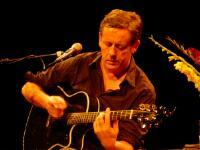 Although quite different from Luka Bloom, he is certainly very talented as well. They both gave this festival that 'little bit extra' that made Dranouter 2006 to a good Dranouter year! Thanks to Petra Van Zuuren. I am still so excited, you wouldn't believe it! It was a great show! Unbelievable really! When Luka went out after having sung for 1.5 hours (!) the house really rocked! I thought it would fall down, really. But let me start at the beginning! I had a seat in the third row (there were seats despite saying "standing place" on the ticket). When I arrived approx. half an hour before the show there were already people sitting in the little room. I was really surprised. All in all there were perhaps - I'm pretty bad at this - 100 in the room. The rows were filled, some people were standing and some were on the balcony. He asked the audience to welcome him after he had said his name ;-) The audience really did give him a great welcome. Luka said/showed it again and again during the show that the audience was great! And we were really great (have never been so proud about a thing like that *giggles). 1. I am not at war - Surprised me that he started with it! 2. Here and now - He said it's more important (regarding the first song!) to be here and now. at least he sang this twice. This song sounds more traditional...but really nice. The audience wouldn't stop clapping here. It was just great! "I'll hope I love you enough to let you go." "...no sweeter places in the world than the places we have been to"
to die or has died. It is a nice song but it was a bit too abrupt for my taste. at least I felt this way - Diamond mountain was also quite sad for me. 13. June - Just great, making me feel more at ease again. and then Luka talked about a girl he had asked what this would be called in Polish. 18. Sunny sailor boy - The audience was absolutely great, I hadn't expected that really. Luka went out for a few seconds and came back! were so good singing along with Sunny Sailor Boy that they even now sang along! He played a very quick style! You couldn't have come at a better time - Here people also sang along. Luka did a fantastic job! So the people really stamped their feet on the floor, clapped their hands like mad...it was an electrifying atmosphere! The show stopped at 10:45 pm, Luka all in sweat. He had changed his shirt for a t-shirt after he went out after the first encore. His voice is really good again. I wasn't sure whether he had absolutely revovered, but he has! So everyone who is going to hear/see him soon - you can all be sure there will be a great Luka coming to the show! And of course a great Sabrina! Sabrina began 15 minutes earlier than announced, at 8:15 pm. She was very nervous again, but also here she was well received by the audience and got a lot of applause!! Then came some songs from the Innocence album, "Innocence" and "Miracle Cure", and "Primavera" got a never ending applause!! "Diamond Mountain", the Bob Dylan song "Make You Feel My Love" and the Cure's "In Between Days"... so far the familiar songs! Then a big surprise, because now he did not sing one of the "new" songs I already knew from the US setlists! We were so lucky and got to hear some completely new songs in Heiligenhaus, rarely performed live before! The first song was written in the beginning of August during the madness in Lebanon, maybe also called "Lebanon", though I don't know for sure if that is the correct title of the song. The third new song "Eastbound Train" - only performed in his bathroom before - was of course about trains, travelling and life and so... ("You never know the way life goes!"). And finally the very emotional song "See you Soon"! This song already known from the US setlists. Some really beautiful new songs, sometimes very sad and moving, but never depressing, and always a wonderful guitar playing! After the four new songs he returned to the old hits: "I'm a Bogman", "I Need Love" (including a new "whistling part"!! ), "The City of Chicago", and "No Matter Where You Go, There You Are", each of the songs a real highlight!!! He finished with a wonderful version of "Sunny Sailor Boy", played for the mermaids in Heiligenhaus and Sabrina Dinan! The encore songs were "Exploring the Blue", "Rainbow Day", "You Couldn't Have Come at a Better Time" and "Black is the Colour"! It was a wonderful show, a nice place and a lovely audience! Yes! We were in Buchholz Empore, which is quite near to my hometown and I went to school in Buchholz for a couple of years. Though I've never been in "Empore" before... In the beginning I liked the venue, they've torn the first 6 rows to place some round tables with 4 or 5 chairs, velvet table cloth in different colours and candles on every table! It looked really nice. So my friend and I sat in the first "real" row and had a wonderful view to the stage. Sabrina performed first, for about half an hour, then there was a break of 15 min and the entertainer let us know that we might buy some drinks before listening to the master himself! That's the thing why I did not like it in Empore that much, think it was not the warm singing atmosphere as in the Fabrik maybe! Nothing to say about the songs and the performing, but the location... hmmm....! Others might have another opinion! What I liked a lot: Luka played "peace on earth" for a little girl of about 12 years in remembrance of the children in Beslan! And also the sunflowers on stage were for her! Such a lovely gesture! This is just a short review of the show in Buchholz! Right now thinking of all the people who are in the Fabrik in Hamburg right now - it's 19:15 and everything should be ready for entrance! The audience gave Sabrina and Luka a very warm welcome. After he had fixed a few technical problems of the sound system in the beginning of the show Luka's performance was nearly perfect and he played once again a wonderful selection of so many great songs, new and old favourites!! Loved to hear again the new songs "Lebanon", "Eastbound Train" and "See You Soon". Then he played another new song that I had never heard before, "Blackwater Side". There was a wonderful introduction to the song, a family story, and he said, it would be a "women song" - sort of "all men are bastards" song - and he really ENJOYS singing it! Also so brilliant again was his celebration of being a "Bogman", "June" and "Rainbow Days"!! Here comes the latest bog news: Luka played a wonderful concert here in the middle of "Devils Bog" in Worpswede. Lucky for me, the parents live just 8 km down the road and surprised me with the entrance ticket for my birthday. The venue is an old style club, nothing really changed from when I was in there for the last time (around 1979) a pub type huge old room with a bar in the back and a little stage. Usually a standing or dancing venue, they had put little round tables out tonight and it was packed! I reckon we were about 500 people, all ears for lovely Sabrina opening the night. Gosh she's good! And what a pretty, overwhelming smile!!! Even though the people were waiting for Luka to start, they all heard her out and gave her some nice rounds of applause. I love the 3 new songs very much, even though the Eastbound Train is a wee bit "American" for my taste, but that's just between us, sung by Luka, it was just lovely. June's lyrics were forgotten by the singer, but I thought that was o.k. at a lovely September day like today. All in all a lovely concert. I am glad I came! May the rest of the German shows see Luka at good health and in such a good mood! I just wanted to say that I am very impressed by Luka's new song "Lebanon". The sound of the word "Lebanon" itself is just lovely, and made me feel touched when sung by Luka. So melodious! And the text of this song is very sensitive again (Luka transports the depth of the situation, i.e. shows us the feeling of the people involved; I am thinking about an old man in that song, trying to keep his grace - what a strong picture!) - just lovely. I hope that everybody will soon have the chance to listen to this song, too! The most impressive "old" song this time for me was "Black is the colour". Luka "played" with his voice like in "Primavera" (high pitch). That was very impressive. At least for me! I wish everyone who is going to see and hear Luka a great time! Enjoy! The Kantine in Köln was a new venue for Luka and for us as well. Outside the city centre it is located in an industrial area, and in addition to the music hall it has a nice beer garden. Also here a lot of high round tables with candles were arranged in the hall, and a good crowd filled the room when Sabrina Dinan opened the show at approx. 8 pm. She began with some songs from her new CD "Heading For The Hills". The CD was just finished before the beginning of the tour in Germany. The songs were: "What The Devil's Dealt", "Dancing Shoes", "The Train Song" and "Captains Little Mama". Then she went on with Nina Simone's song "Love Me Or Leave Me". Before she started with singing she asked if there were any Nina Somone fans in the audience and when nobody answered, she said, "NO?? sh*t.." :-) Her version of the song was so beautiful, that it may have even made some new fans for Nina Simone's music! The last two songs of her set were new and not named yet, both very beautiful too (a favourite song line that stucks in my head, "I come to your rescue even I am late, because you are my soulmate"). She was also talking about her touring in Germany and how much she loves it, and it seems everyone in the audience loved her too! She got a lot of applause for her performance. After a break of 15 minutes in which Sabrina was selling her and Luka's CDs, Luka came out. He played a very powerful concert, full of energy! Opening in German - this time "Meine lieben Kölners!" and that he would be happy to be in Cologne again! - the set of course started again with "I Am Not At War With Anyone" and all we have is the "Here and Now", followed by the title track of his latest album "Innocence", the wonderful introduction to "Diamond Mountain" was again two minutes longer than the song itself, and "Primavera". The three new songs he played tonight were "Lebanon", "Eastbound Train" - once again joined by the audience to the end of the song: "You never know the way life goes!" - and finally "See you Soon". Then back to the "hits" again, the two cover songs "Make You Feel My Love" and "In Between Days", followed by "June" and the instrumental "Peace on Earth", dedicated to the children of Beslan. "The City of Chicago" came again with a great story, "No Matter Where You Go, There You Are", "Sunny Sailor Boy", dedicated to the "junge Meerfrauen in Köln", "I'm a Bogman" another highlight, followed by some Landei-Rap "I Need Love"! The first encore included "Exploring the Blue", "You", "Don't Be So Hard On Yourself", "Rainbow Day" and "You Couldn't Have Come at a Better Time". When the applause didn't stop, he came out for a second encore: "Perfect Groove" and finally a very beautiful version of "Raglan Road" - for him one of the greatest Irish love songs - was the perfect closing song of the night! The last show of the tour took place in Leuven, a nice little town near Brussels. When the doors opened at 8 pm, a lot of people were already waiting in front of the venue. The arrangement in the hall of the Muziekcentrum Het Depot was different to the other places we went to. There was a large space just in front of the stage for the standing audience and several rows of seats like in a theatre in the back, so the distance between the stage and the seated part of the venue was relatively huge. People were pouring in and most of the seats were taken very soon, and some people slowly filled the space in front of the stage. The Belgian singer Marjan Debaene was the first opening act. She introduced some songs from her new album "Wolfish Times". I am not familiar with her music, so I don't remember the name of the songs she played, but she was very good and at the end of her set she got a lot of applause. When Sabrina Dinan entered the stage it seemed the audience was not too excited about a second (unannounced) support act, but that changed very quickly during her wonderful performance. She began with "What The Devil's Dealt" from her new CD "Heading For The Hills", followed by "Dancing Shoes", "The Train Song" and "Captains Little Mama". When she finished with a great cover version of Marvin Gaye's song "Sexual Healing", she got a lot of applause as well. The space in front of the stage looked still a bit empty, and people were still moving around during the performances of the support acts, maybe a bit distracting for the performing artists and the seated audience too. After a short intermission Luka came out, and now more people than before filled the standing area in front of the stage. He did his usual introduction "My name is Luka Bloom..." and he received a very warm and enthusiastic welcome from the crowd! He told us about his beautiful memory of a performance at the Marktrock Festival ten years ago. It was 1am in the morning at the Old Market Square (Oude Markt) in Leuven and he was waiting to go on stage after Iggy Pop ~ (called the 'Godfather of Punk') ~ who was so unbelievably loud and powerful! He said, he didn't know how to survive a festival audience at 1am in the morning after Iggy Pop! He was so nervous, that he had problems to tune his guitar and he only wanted to go home!! But then he went out and started to play ~ started playing "Sunny Sailor Boy" ~ and thousands of people were singing "Ooh-wah Ooh-wah, Ooh-wah Ooh-wah" and he felt save!! He continued to play the melody when he dedicated this first song to all the people in front of him, "who preferred to be close to the action and to him than to be comfortable in their seats!" and he invited more people to come to the front because he would play much better when he can smell the audience! It's a little risk to play this song already in the beginning of a concert, because normally the audience has not really warmed up yet and hesitates to sing along, but it went very well in Leuven and he was very pleased with the result: "even the men in Leuven seemed to be in touch with their inner mermaid!" He went on with his "regular" opening song of the tour "I Am Not At War With Anyone", before he brought back the summer to Leuven by celebrating his favourite month of the year in Ireland, "June" - I always love the way it pulls me in!! :-) Talking about becoming fifty and releasing an album called "Innocence" last year was the introduction to the title track of the album. His first visit to Australia in 1992 and the connection of people to places in Ireland where they have never been to were the inspiration for him to write the next song, "Diamond Mountain" - judging the reaction of the audience this song seems to be a huge favourite of many, many fans!! Bob Dylan's wonderful love song "Make You Feel My Love" and Robert Smith's "In Between Days", the Cure's "Gothic folk song" - so different they are, he always likes performing the two songs together like twins. After the cover songs he played the lovely instrumental "Peace on Earth", dedicated to the children of Beslan. His next song "The City of Chicago" was written in 20 minutes in 1984, and it was so painless for him that he thought the song was not good. Two weeks later his brother Christy heard him singing this song and as we all know, he took it over immediately and made it to a very popular and well-known song! After getting his permission last year he finally recorded it himself... :-) I LOVE IT!! Another new song, "Eastbound Train" - "a light little song with a little bit of darkness in it" - his favourite songs. For two months he was only singing it in his bathroom at home, but of course one day he had to try it on human beings. It happened in Heiligenhaus, at one of the first shows in Germany a few weeks ago. He played it during the soundcheck and Sabrina liked it, so he decided to play it that night (and he has been playing it ever since)! When he played "No Matter Where You Go, There You Are" - a "celebration of immigration", insprired by his friend Mohamed who now lives in Galway - the great rhythm of the song made some people clapping and tonight he didn't mind. Then he finished the main set with a brilliant version of "I Need Love" - getting a spontaneous applause after the new whistling part, and a long and overwhelming applause at the end of the song!! The first encore started with a costume change and some favourite oldies: "Exploring The Blue" and "Gone To Pablo". A wonderful version of "Rainbow Day" and "You Couldn't Have Come At A Better Time" followed, and again some people started clapping during the songs and again no complaints... it ended with a standing ovation!! "Perfect Groove" - "together we'll find the rhythm, get into the song, the night could be long!" It was a special night in Leuven, the last night of the tour and a full moon night, and it was also a very special night of his life. On the 8th of October 1956 his father died very sudden and unexpected when he was only 18 months old. "The Man is Alive" - it took him 35 years to write this song and he dedicated it to his family back home! This song is also one of my most favourite songs, rarely performed live. I had not expected to hear it tonight, but that he played it and the reason why made this great concert to a very special one. It was a wonderful and unforgettable way to end the show and the tour! Rena, Erwin and I made our typical pilgrimage to Dublin to enjoy ourselves together, go sightseeing, and of course to see Luka. We love it when Luka is playing in Dublin and we have vacation days to spend -- it makes for an irresistible excuse to get away! We'd been to Whelan's on other occasions to see various gigs, and comfortably enjoy ourselves there. More than a mere welcoming essence, you get the feeling of being enfolded into this pub's spirit and soul, entering into a moment where collective memories of past, present and future innately exist, mischievously winking at the present participants. Perhaps this is typical of old Irish pubs. Arriving early, there was already a full queue waiting for the doors to open. This happened to be a long line of folks who had purchased from Ticketmaster. We did try earlier in the day to pick up the actual tickets from the box office, which was open and staffed, but the disinterested clerk sent us up to St. Stephen's Green Mall to the Ticketmaster outlet, which, in turn, sent us back to the box office. Oh, well. Just before the doors opened, a horde of people quite smugly pushed ahead of the queue and entered the venue. They had actual ticket-in-hand, whereas we plebeians had to scroll past the ticket window to obtain ours. When we entered, we found tables and chairs were in place and had now all been occupied. So, we walked around looking for a good place to stand. Many thanks to Rena who recorded the set list. She wrote me a copy before we left Dublin. It was quite a stunning presentation, with a wonderful mix of old, new and in-between. The crowd much revered this Priest of Love, adoring him with smiling faces and bright eyes. That was the intimate circle. The crowd that hugged the bar were fans as well, but they were more interested in a night out with good music rather than to pay homage to this artist. Well, so what. They put up a little pubby raucous during the intermittent whistling of I Need Love. Luka didn't flinch, but did have to hold his hand up to signal that the light-hearted taunting during this part of the song was inappropriate. It took a bit for them to get the general idea and quiet down. The crowd glorified Sunny Sailor Boy, welcoming it with surprise and delight. Surprise, because, after all these years of singing it, we think, perhaps, he must sooner or later give it up, and yet here it is, one more time! And delight, because it offers the chance for each and every one in the audience to lovingly respond to this dear man who is tenderly caressing them with his music, his eyes, his attentiveness. Luka jokes lately about 'the 2 or 3 people in the audience who don't know this song', but newcomer or seasoned admirer, no one in his congregation leaves this song feeling less than sublimely impassioned. Eastbound Train also has a lovely refrain! Luka taught us to sing it with the patience and care of a loving father to a child. When we mastered it he sang a backup to the refrain, in much the same style as Don't Be Afraid of the Light That Shines Within You. We continued this sacramental, mesmerizing, 'in-and-with' chant for a long, long time. ah, this priest of ours..
Alrighty, then -- his turn to confess! He admitted that he felt conflicted between playing two songs that were similar, and asked us to decide which one we'd like to hear. It was Diamond Mountain vs. Water Ballerina. Everyone yelled out. Diamond Mountain! and then sat back to enjoy it thoroughly. But, it wasn't too long before he played Water Ballerina, anyway! He said his sister Eilish was in the audience and he wanted to play it for her, as she was celebrating her birthday this week. He went on to tease about her age, in the way only a little brother can do. We enjoyed that outspoken reverie, and wondered where she was in the audience. I passed her on the way out, and was greeted by her sweet face and cheerful eyes. Chatting on about sister Anne, as well, he introduced Blackwater Side. Assuaging his conscience for 'stealing her song', he gave her a loving review: how she sings it so beautifully. But, then grinch-ishly, 'now he's 'got it' and she'll have to find a new one to sing!' He spoke of her with much affection, and I think I'd really love to hear her singing on a future CD of his! By the end of his set, from Diamond Mountain through to I Need Love, the crowd was fully engorged -- overstuffed yet unsatiated. He left the stage and returned immediately for an encore. The audience could no longer contain their individual reverent, pious adoration. All passion broke loose: vivacity, warmth, heart-felt affection wove its way significantly among us, encircling us with sure, warm and loving arms, drawing us closer to the inner core of the night's magic. The music was loud and wonderful (and Paul Scully looking dashing at the soundboard!) and everyone was singing-loudly! It just happened - it was gorgeous to be in a crowd singing Luka songs, singing our hearts out, and, oh, yeh, with Luka there, too! And you could sing however you wanted, and as loudly and as joyously as you wanted, and suddenly I stopped, remembering a night in BB Kings where other patrons shushed the singers. no! this wasn't happening at Whelan's! Wow! I'm actually singing Ciara with Luka in my happy, harmonious way and these wonderful people here with me are all singing, too. To make a note of the frenzy. he was well into Ciara before I even recognized what song it was. Well, he no longer plays Delirious. but he sure brought us to that state! When Our Priest left the stage, he was clapped back on. The crowd was insistent. After that frenzied finale, he was at a loss as to what to sing. Someone called out 'Monsoon!'. He was delighted, and remarked: Good choice! Indeed. It was a monsoon, right here, right now.